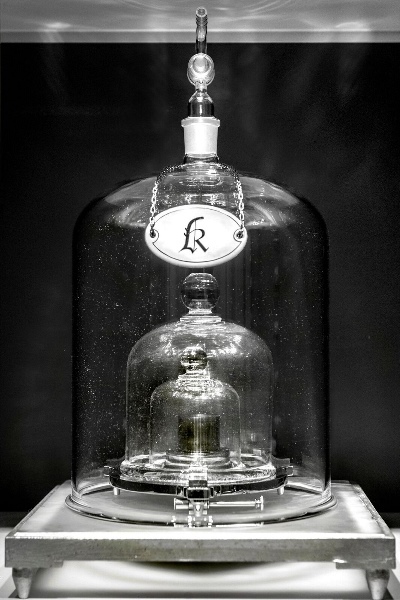 The General Conference on Weights and Measures voted today to redefine the kilogram. The official definition no longer refers to the mass of the International Prototype of the Kilogram (IPK) stored at the BIPM (Bureau International des Poids et Measures) in France. The Coulomb, kelvin, and mole have also been redefined. The vote took place today, 2018-11-16, and the new definitions will officially begin 2019-05-20.
h = 6.62607015 × 10-34 kg m2 s-1. Now this is the exact value of Planck’s constant by definition, implicitly defining the kilogram. went from being a measurement to a definition, much as the measurement of Planck’s constant became a definition . So now the physics of cesium-133 defines the second, the speed of light defines the meter, and Planck’s constant defines the kilogram. There are no more SI units defined by physical objects. and now this equation is exact by definition, defining the coulomb in terms of the elementary charge. And since the ampere is defined as flow of one Coulomb per second, this also changes the definition of the ampere. for the Boltzmann constant is exact by definition, defining K.
NA = 6.02214076 × 1023 mol-1. Incidentally, when I first started my Twitter account @UnitFact for units of measure, I used the standard kilogram as the icon. Then some time later I changed the icon to a Greek mu, the symbol for “micro” used with many units. The icon for @ScienceTip, however, is Planck’s constant! The meter was originally defined in 1791 to be one ten-millionth of the distance from the equator to the North Pole. In 1889, it was redefined to be the distance between two marks on a metal bar stored at BIPM. In 1960 the meter was defined in terms of the spectrum of krypton-86, the first definition that did not depend on an object kept in a vault. In 1983 the definition changed to the one above, making the speed of light exact. The second was defined in terms of the motion of the earth until 1967 when the definition in terms of cesium-133 was adopted. The p-norm of a vector is defined to be the pth root of the sum of its pth powers. to at least four decimal places. Since the ratio is tantalizingly close to 2/3, some believe there’s something profound going on here and the value is exactly 2/3, but others believe it’s just a coincidence. The value of 2/3 is interesting for two reasons. Obviously it’s a small integer ratio. But it’s also exactly the midpoint between the smallest and largest possible value. More on that below. Is the value 2/3 within the measure error of the constants? We’ll investigate that with a little Python code. The masses of particles are available in the physical_constants dictionary in scipy.constants. For each constant, the dictionary contains the best estimate of the value, the units, and the uncertainty (standard deviation) in the measurement . This says that the ratio of the 1 norm and 1/2 norm is 0.666658, slightly less than 2/3. Could the value be exactly 2/3 within the resolution of the measurements? How could we find out? which returns 0.6666674, just slightly bigger than 2/3. Since the value can be bigger than 2/3, and less than 2/3, the intermediate value theorem says there are values of the constants within one standard deviation of their mean for which we get exactly 2/3. Now that we’ve shown that it’s possible to get a value above 2/3, how likely is it? We can do a simulation, assuming each measurement is normally distributed. When we I ran this, I got 168 values above 2/3 and the rest below. So based solely on our calculations here, not taking into account any other information that may be important, it’s plausible that Koide’s ratio is exactly 2/3. Strictly speaking, we should take the absolute values of the vector components. Since we’re talking about masses here, I simplified slightly by assuming the components are non-negative. Also, what I’m calling the p “norm” is only a norm if p is at least 1. Values of p less than 1 do occur in application, even though the functions they define are not norms. I’m pretty sure I’ve blogged about such an application, but I haven’t found the post. The SciPy library obtained its values for the constants and their uncertainties from the CODATA recommended values, published in 2014. It’s been known for some time that carbon can form structures with positive curvature (fullerenes) and structures with zero curvature (graphene). 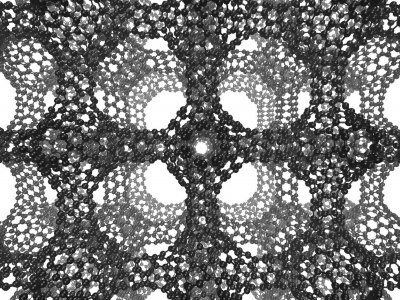 Recently researches discovered a form of carbon with negative curvature (schwartzites). News story here. The butterfly effect is the semi-serious claim that a butterfly flapping its wings can cause a tornado half way around the world. It’s a poetic way of saying that some systems show sensitive dependence on initial conditions, that the slightest change now can make an enormous difference later. Often this comes up in the context of nonlinear, chaotic systems but it isn’t limited to that. I give an example here of a linear differential equation whose solutions start out the essentially the same but eventually diverge completely. Once you think about these things for a while, you start to see nonlinearity and potential butterfly effects everywhere. There are tipping points everywhere waiting to be tipped! 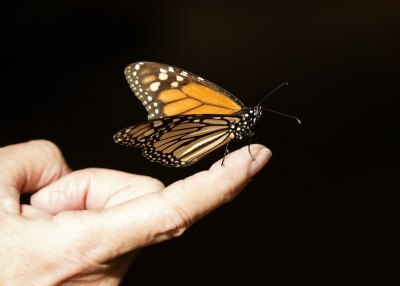 But a butterfly flapping its wings usually has no effect, even in sensitive or chaotic systems. You might even say especially in sensitive or chaotic systems. Sensitive systems are not always and everywhere sensitive to everything. They are sensitive in particular ways under particular circumstances, and can otherwise be quite resistant to influence. Not only may a system be insensitive to butterflies, it may even be relatively insensitive to raging bulls. The raging bull may have little more long-term effect than a butterfly. This is what I’m calling the other butterfly effect. In some ways chaotic systems are less sensitive to change than other systems. And this can be a good thing. Resistance to control also means resistance to unwanted tampering. Chaotic or stochastic systems can have a sort of self-healing property. They are more stable than more orderly systems, though in a different way. The lesson that many people draw from their first exposure to complex systems is that there are high leverage points, if only you can find them and manipulate them. They want to insert a butterfly to at just the right time and place to bring about a desired outcome. Instead, we should humbly evaluate to what extent it is possible to steer complex systems at all. We should evaluate what aspects can be steered and how well they can be steered. The most effective intervention may not come from tweaking the inputs but from changing the structure of the system. A while back I wrote about how planets are evenly spaced on a log scale. I made a bunch of plots, based on our solar system and the extrasolar systems with the most planets, and said noted that they’re all roughly straight lines. Here’s the plot for our solar system, including dwarf planets, with distance on a logarithmic scale. This post is a quick follow up to that one. You can quantify how straight the lines are by using linear regression and comparing the actual spacing with the spacing given by the best straight line. Here I’m regressing the log of the distance of each planet from its star on the planet’s ordinal position. NB: I am only using regression output as a measure of goodness of fit. I am not interpreting anything as a probability. R² is typically interpreted as how much of the variation in the data is explained by the model. In the table above, the smallest value of R² is 94%. p-values are commonly, and wrongly, understood to be the probability of a model assumption being incorrect. As I said above, I’m completely avoiding any interpretation of p-values as the probability of anything, only noting that small values are consistent with a good fit. Journals commonly, and wrongly, are willing to assume that anything with a p-value less than 0.05 is probably true. Some are saying the cutoff should be 0.005. There are problems with using any p-value cutoff, but I don’t want to get into here. I’m only saying that small p-values are typically seen as evidence that a model fits, and the values above are orders of magnitude smaller than what journals consider acceptable evidence. When I posted my article about planet spacing I got some heated feedback saying that this isn’t exact, that it’s unscientific, etc. I thought that was strange. I never said it was exact, only that it was a rough pattern. And although it’s not exact, it would be hard to find empirical studies of anything with such a good fit. If you held economics or psychology, for example, to the same standards of evidence, there wouldn’t be much left. This pattern is known as the Titius-Bode law. I stumbled on it by making some plots. I assumed from the beginning that someone else must have done the same exercise and that the pattern had a name, but I didn’t know that name until later. Someone sent me a paper that analyzes the data on extrasolar planets and Bode’s law, something much more sophisticated than the crude sketch above, but unfortunately I can’t find it this morning. I don’t recall what they did. Maybe they fit a hierarchical model where each system has its own slope and intercept. One criticism has been that by regressing against planet order, you automatically get a monotone function. That’s true, but you do get a much better fit on a log scale than on a linear scale in any case. You might look at just the relative planet spacings without reference to order. Now obviously we know there’s life on Earth. But if we’re going look for life on other planets, it’s reasonable to ask that our methods return positive results when examining the one planet we know for sure does host life. So scientists looked at the data from Galileo as if it were coming from another planet to see what patterns in the data might indicate life. I’ve started using looking for life on Earth as a metaphor. I’m working on a project right now where I’m looking for a needle in a haystack, or rather another needle in a haystack: I knew that one needle existed before I got started. So I want to make sure that my search procedure at least finds the one positive result I already know exists. I explained to a colleague that we need to make sure we can at least find life on Earth. This reminds me of simulation work. You make up a scenario and treat it as the state of nature. Then pretend you don’t know that state, and see how successful your method is at discovering that state. It’s sort of a schizophrenic way of thinking, pretending that half of your brain doesn’t know what the other half is doing. It also reminds me of software testing. The most trivial tests can be surprisingly effective at finding bugs. So you write a few tests to confirm that there’s life on Earth. 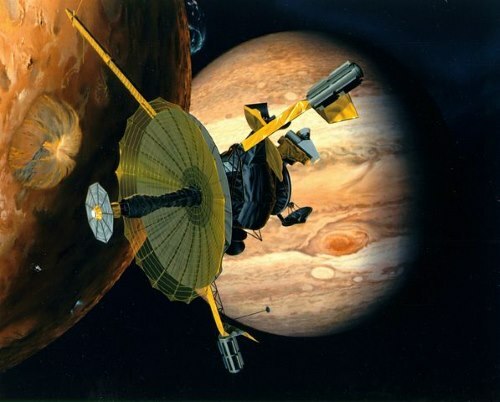 I found out about Galileo’s Earth reconnaissance listening to the latest episode of the .NET Rocks! podcast. To first approximation, Earth is a sphere. A more accurate description is that the earth is an oblate spheroid, the polar axis being a little shorter than the equatorial diameter. See details here. Other planets are also oblate spheroids as well. Jupiter is further from spherical than the earth is more oblate. An ellipsoid has three semi-axes: a, b, and c. For a sphere, all three are equal to the radius. For a spheroid, two are equal. In an oblate spheroid, like Earth and Jupiter, a = b > c. For a prolate spheroid like Saturn’s moon Enceladus, a = b < c.
The dwarf planet Haumea is far from spherical. It’s not even a spheroid. It’s a general (tri-axial) ellipsoid, with a, b, and c being quite distinct. It’s three semi-axes are approximately 1000, 750, and 500 kilometers. The dimensions are not known very accurately. 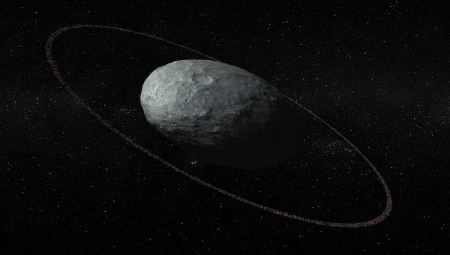 The image above is an artists conception of Haumea and its ring, via Astronomy Picture of the Day. This post explains how to compute the volume and surface area of an ellipsoid. See that post for details. Here we’ll just copy the Python code from that post. My previous post showed that planets are roughly evenly distributed on a log scale, not just in our solar system but also in extrasolar planetary systems. I hadn’t seen this before I stumbled on it by making some plots. I didn’t think it was an original discovery—I assume someone did this exercise immediately when systems with several planets were discovered—but I didn’t know what this observation was called. I now know it’s known as the Titius-Bode law, a generalization of an observation about our solar system by Messrs. Titius and Bode a couple centuries ago. See, for example, . Several people were skeptical of the claim that planets are distributed according to a power law and pointed out that uniformly distributed points can look fairly evenly distributed on a logarithmic scale. Which is true, and gets to the topic I want to discuss in this post. Planets are not spaced like uniform random samples (see ) and yet it reasonable, at first glance, to ask whether they are. If you’re expecting a power law, and you’re given uniformly distributed data, it doesn’t look too surprising. On the other hand, if you’re expecting uniformly distributed data and you see data distributed according to a power law, you are surprised. I’ll formalize this below. If you’ve ever tried to make a scaled model of our solar system, you were probably surprised that the planets are far from uniformly spaced. A scaled model of our solar system, say at a museum, is likely to position a few of the inner planets to scale, and then use text to explain where the outer planets should be. For example, there may be a footnote saying “And if everything were to scale, Pluto would be behind the Exxon station at the end of the street.” This is an example of implicitly expected a uniform distribution and receiving data distributed according to a power law. Some people suspected that I was doing the opposite. By plotting distances on a log scale, I’m implicitly expected a power law distribution. Maybe the data were roughly uniform, but I fooled myself into seeing a power law. The Kullback-Leibler divergence from Y to X, written KL(X || Y), is the average surprise of seeing Y when you expected X. That’s one of the interpretations. See this post for more interpretations. In general, Kullback-Leibler divergence is not symmetric. The divergence from X to Y typically does not equal the divergence from Y to X. The discussion above claims that the surprise from seeing power law data when expecting a uniform distribution is greater than the surprise from seeing uniform data when expected a power law distribution. We show below that this is true. Let X be random variable uniformly distributed on [0, 1] and let Y be a random variable with distribution proportional to xα on the same interval. (The proportionality constant necessary to make the probability integrate to 1 is α + 1.) We will show that KL(X || Y) is greater than KL(Y || X). First we calculate the two divergences. And here is a plot comparing the two results as a function of the exponent α. Why is Kullback-Leibler divergence asymmetric? The previous post was about Kepler’s observation that the planets were spaced out around the sun the same way that nested regular solids would be. Kepler only knew of six planets, which was very convenient because there are only five regular solids. In fact, Kepler thought there could only be six planets because there are only five regular solids. The distances to each of the planets is roughly a geometric series. Ratios of consecutive distances are between 1.3 and 3.4. That means the distances should be fairly evenly spaced on a logarithmic scale. The plot below shows that this is the case. The plot goes beyond the six planets known in Kepler’s day and adds four more: Uranus, Neptune, Pluto, and Eris. Here I’m counting the two largest Kuiper belt objects as planets. Distances are measured in astronomical units, i.e. Earth = 1. Update: The fit is even better if we include Ceres, the largest object in the asteroid belt. It’s now called a dwarf planet, but it was considered a planet for the first fifty years after it was discovered. Is this just true of our solar system, or is it true of other planetary systems as well? At the time of writing, we know of one planetary system outside our own that has 8 planets. Three other systems have around 7 planets; I say “around” because it depends on whether you include unconfirmed planets. The spacing between planets in these other systems is also fairly even on a logarithmic scale. Data on planet distances is taken from each system’s Wikipedia page. Distances are semimajor axes, not average distances. This post just shows plots. See this follow up post for regression results. Kepler-90 is the only planetary system outside our own with eight confirmed planets that we know of. HD 10180 has seven confirmed planets and two unconfirmed planets. The unconfirmed planets are included below, the 3rd and 6th objects. The next largest system is HR 8832 with five confirmed planets and two unconfirmed, numbers 5 and 6 below. It would work out well for this post if the 6th object were found to be a little closer to its star. TRAPPIST-1 is interesting because the planets are very close to their star, ranging from 0.01 to 0.06 AU. Also, this system follows an even logarithmic spacing more than the others. There are currently four known systems with four planets: Kepler-11, Kepler-20, HD 40307, and HD 34445. They also appear to have planets evenly spaced on a log scale. Like TRAPPIST-1, Kepler-20 has planets closer in and more evenly spaced (on a log scale).